The man of many talents, Antonio Margheriti, tries his hands at what appears to be at first glance, an aquatic horror film. While it does contain a handful of sequences that place it in the 'Killer Animal' subgenre, this picture could just as easily fall into the 'Disaster' movie category. Worth seeking out more as a curiosity piece, it's an unusual, but occasionally fun movie in the directors career. A band of jewel thieves pull off an emerald heist from a mining factory. After causing the destruction of the facility, the greedy group decide to dump the cache at the bottom of a lake to be retrieved later. However, some of the crooks feel they are entitled to be the sole owners of the stolen goods. They soon learn that someone has dumped a number of piranha into the lake. 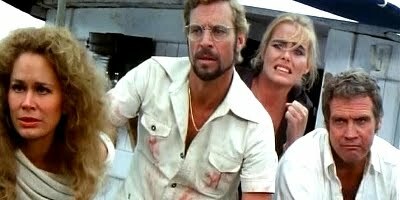 The killer fish have multiplied and a massive hurricane destroys a dam unleashing the nasty nibblers onto the stranded vacationers of a Brazilian resort. Our cast of characters are later trapped on a rapidly sinking boat surrounded by the voracious piranha. The cast is stunning for this kind of thing. Lee Majors, Karen Black, James Franciscus, Margeaux Hemingway, Anthony Steffen and Gary Collins are among the stars. Margheriti packs the film with a lot of miniature work and explosions that are more effective than models seen in later Italian productions. At times the piranhas seem like an afterthought amidst the destruction. Majors also had a financial interest in the film along with co-producer, Carlo Ponti. It's easily digestible Saturday afternoon entertainment.